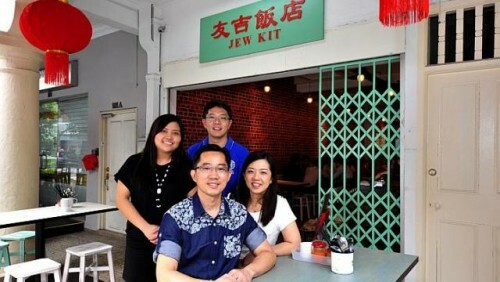 IT IS not an uncommon story: Chicken rice chain owner Teo Jew Kit, 46, did not finish secondary school as he needed to work to support his family. More unusually, the chairman of Jew Kit Hainanese Chicken Rice, which began life in a Bukit Batok coffee shop, went back to school this year. He and his wife, Ms Florence Toh, the company's managing director, enrolled themselves and more than half of their 40 staff in two Singapore Workforce Skills Qualification courses. The bosses and senior staff are attending a diploma course in leadership and people management, while the others are learning skills such as teamwork and managing emotions at the workplace. Mr Teo said he has sent staff for courses since 2010. "In our line, we have to deal closely with people. Not only must our food taste good, but also we must think of ways to keep our customers happy," he said in Mandarin. Though still a rare breed in such courses, family-run businesses like theirs are starting to see the advantages of getting their workers trained in soft skills such as teamwork and communication to boost productivity, training provider Kaplan said yesterday. It has received 20 per cent more inquiries over the past six months from family businesses in industries such as food and beverage, logistics and engineering. Seven such businesses have sent workers for training this year, compared with none in the past two years. Mr Wayne Marriott, Kaplan's director of curriculum and learning design, said he has noticed more interest from the owners of small and medium-sized enterprises in attending courses. About three in 10 who approached Kaplan have done so. "This is the combination of an entrepreneurial mindset with a lifelong learning approach applied to the entire workforce of an organisation," said Mr Marriott. Jew Kit's Ms Toh, 46, completed one module over two evenings last month, and said being in class together helps bosses and staff understand one another better. She said: "In the labour crunch, it's hard to hire new people, so we hope we can use this training to encourage those with potential to stay on."